Aside from grilling it, this is by far, my favorite way to eat Asparagus. Not that I'd ever complain about eating Asparagus at all-it's one of my favorite vegetables. 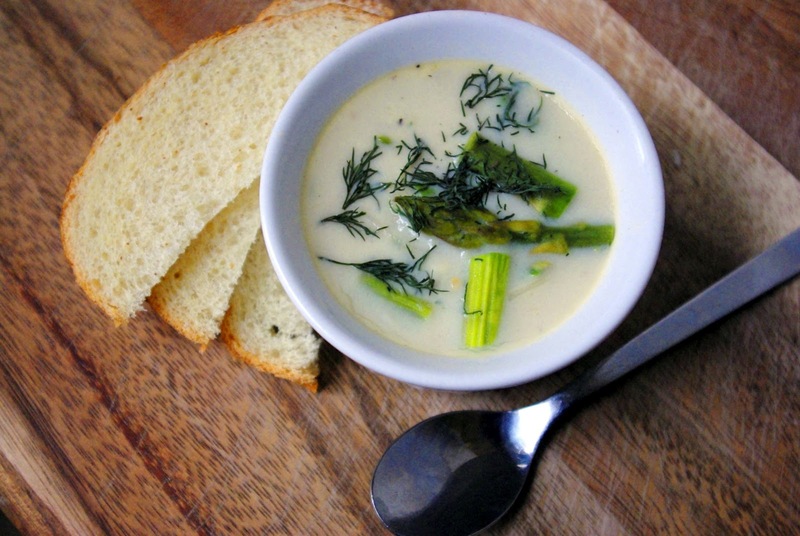 But in a creamy soup, paired with some tangy dill and black pepper, you just can't go wrong. This Recipe serves 8 pretty generously, but between Zeke and I, it's gone in no time. We'll eat it over the course of a couple of days until it's gone...and then we'll make more. Melt butter over medium heat, and add shallots, garlic and sage, and increase the heat. Let the shallots and garlic fry, while stirring continuously. Allow them to brown until they're almost crispy. Add in black pepper. Reduce the heat, and slowly stir in 4 of the tbsp of butter, until you have a creamy paste. Once you have a flour paste with an even consistency, slowly stir in 5.5 cups of milk. Whisk together the remaining half cup of milk with the remaining 4 tbsp of flour in a separate bowl until smooth. Then slowly add to the rest of the soup while stirring. Keep it over a medium heat for another couple of minutes while it thickens. Season with salt to taste and you're all set. 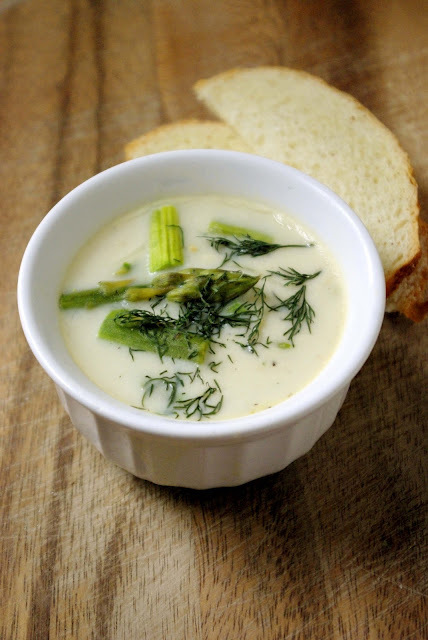 Garnish with dill, (and sour cream too, if you're feeling extra fancy) and serve it with some good, crusty bread. That looks amazing Corabelle! So heart warming just looking at the pictures. Now that sounds amazing! ;) Wish I had asparagus in the house...yum!